WOMENS HAIR LOSS TREATMENT THAT WORKS. 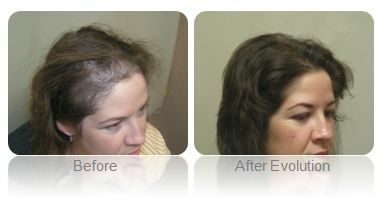 More than 50% of Evolution Hair Loss Institute's clients are female. We understand how traumatic the issue of hair loss can be for women and have designed specific protocol for our female clients. 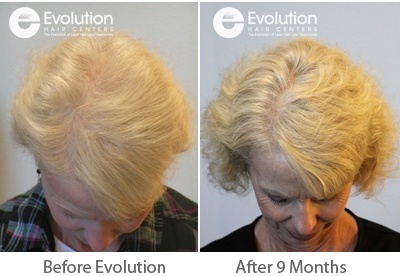 The success rate of women participating in Evolution Elite Hair Regeneration Programs have matched and exceeded the success of our male clients. Is Female Hair Loss is Reversable for You? More than just genetically inherited pattern hair loss, women specifically are susceptible to sudden hair loss triggered by hormonal imbalance, thyroid conditions*, childbirth, new use or change in methods of contraception and certain medications. Like men, women may also experience hair loss due to auto-immune disorders, recent physical and/or emotional trauma (such as surgery or a car accident), fungal infections of the scalp, and environmental factors (poor diet, smoking, excessive alcohol consumption, toxins in the body). If you have tried other treatment plans or products before, Evolution's Mutli-Therapy Clinical approach can succeed where others have failed. Evolution Elite Hair Regeneration Programs provide non-invasive holistic detoxification, nutraceutical supplementation, organic hair care products, and our proprietary topical blends in conjunction with our low level laser therapy. These elements combined work synergistically to heal your scalp, detoxify your body, stop hair loss and accelerate new, healthy hair growth. Evolution simply gives you the tools to regrow your own hair, naturally. 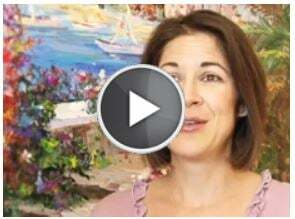 Want to talk about your individual situation prior to coming into the clinic? Call 480-222-4247 for your free phone consultation. For further information and to book your complimentary consultation, contact Evolution Hair Loss Institute at 1-888-527-4255.